On the Great Plains, environmental catastrophe deepened America’s longstanding agricultural crisis and magnified the tragedy of the Depression. Beginning in 1932, severe droughts hit from Texas to the Dakotas and lasted until at least 1936. The droughts compounded years of agricultural mismanagement. To grow their crops, Plains farmers had plowed up natural ground cover that had taken ages to form over the surface of the dry Plains states. Relatively wet decades had protected them, but, during the early 1930s, without rain, the exposed fertile topsoil turned to dust, and without sod or windbreaks such as trees, rolling winds churned the dust into massive storms that blotted out the sky, choked settlers and livestock, and rained dirt not only across the region but as far east as Washington, D.C., New England, and ships on the Atlantic Ocean. The “Dust Bowl,” as the region became known, exposed all-too-late the need for conservation. The region’s farmers, already hit by years of foreclosures and declining commodity prices, were decimated. For many in Texas, Oklahoma, Kansas, and Arkansas who were “baked out, blown out, and broke,” their only hope was to travel west to California, whose rains still brought bountiful harvests and–potentially–jobs for farmworkers. It was an exodus. Oklahoma lost 440,000 people, or a full 18.4 percent of its 1930 population, to out-migration. This iconic photograph made real the suffering of millions during the Great Depression. Dorothea Lange, “Destitute pea pickers in California. Mother of seven children. Age thirty-two. Nipomo, California” or “Migrant Mother,” February/March 1936. Library of Congress. Dorothea Lange’s Migrant Mother became one of the most enduring images of the “Dust Bowl” and the ensuing westward exodus. Lange, a photographer for the Farm Security Administration, captured the image at migrant farmworker camp in Nipomo, California, in 1936. 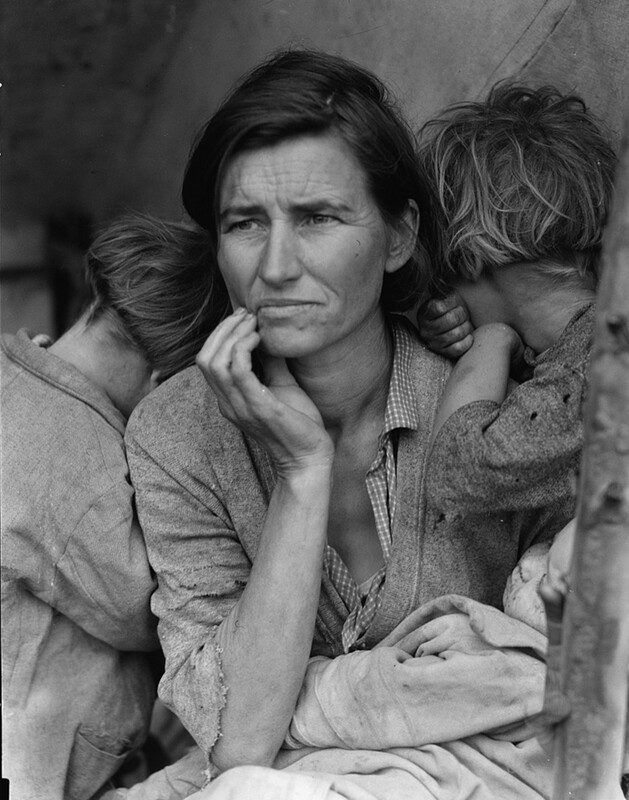 In the photograph a young mother stares out with a worried, weary expression. She a migrant, having left her home in Oklahoma to follow the crops in the Golden State. She took part in what many in the mid-1930s were beginning to recognize as a vast migration of families out of the southwestern plains states. In the image she cradles an infant and supports two older children, who cling to her. Lange’s photo encapsulated the nation’s struggle. The subject of the photograph seemed used to hard work but down on her luck, and uncertain about what the future might hold. The “Okies,” as such westward migrants were disparagingly called by their new neighbors, were the most visible group many who were on the move during the Depression, lured by news and rumors of jobs in far flung regions of the country. By 1932 sociologists were estimating that millions of men were on the roads and rails travelling the country. Economists sought to quantify the movement of families from the Plains. Popular magazines and newspapers were filled with stories of homeless boys and the veterans-turned-migrants of the Bonus Army commandeering boxcars. Popular culture, such as William Wellman’s 1933 film, Wild Boys of the Road, and, most famously, John Steinbeck’s Grapes of Wrath, published in 1939 and turned into a hit movie a year later, captured the Depression’s dislocated populations. Sympathy for migrants, however, accelerated late in the Depression with the publication of John Steinbeck’s Grapes of Wrath. The Joad family’s struggles drew attention to the plight of Depression-era migrants and, just a month after the nationwide release of the film version, Congress created the Select Committee to Investigate the Interstate Migration of Destitute Citizens. Starting in 1940, the Committee held widely publicized hearings. But it was too late. Within a year of its founding, defense industries were already gearing up in the wake of the outbreak of World War II, and the “problem” of migration suddenly became a lack of migrants needed to fill war industries. Such relief was nowhere to be found in the 1930s. Exclusionary measures hit Mexican immigrants particularly hard. The State Department made a concerted effort to reduce immigration from Mexico as early as 1929 and Hoover’s executive actions arrived the following year. Officials in the Southwest led a coordinated effort to push out Mexican immigrants. In Los Angeles, the Citizens Committee on Coordination of Unemployment Relief began working closely with federal officials in early 1931 to conduct deportation raids while the Los Angeles County Department of Charities began a simultaneous drive to repatriate Mexicans and Mexican Americans on relief, negotiating a charity rate with the railroads to return Mexicans “voluntarily” to their mother country. According to the federal census, from 1930 to 1940 the Mexican-born population living in Arizona, California, New Mexico and Texas fell from 616,998 to 377,433. Franklin Roosevelt did not indulge anti-immigrant sentiment as willingly as Hoover had. Under the New Deal, the Immigration and Naturalization Service halted some of the Hoover Administration’s most divisive practices, but, with jobs suddenly scarce, hostile attitudes intensified, and official policies less than welcoming, immigration plummeted and deportations rose. Over the course of the Depression, more people left the United States than entered it.